This was bad week. I have been self-treating for Lyme and Bartonella. Old symptoms flared and new ones appeared this week —- headaches, brain fog, fatigue, heart pain, joint pain, swelling in my legs, ankes, and feet. The swelling affects my right leg, ankle and foot more for some reason. The flare is “good” if I am killing the bugs, in which case, I will bounce back. But the concern that my symptoms signify other issues weighs heavily —–the waiting, and the hoping, and depending exclusively on myself is the hard part. this was a good week. The children and I have pondered psalms. We have drawn silly pictures illustrating vocabulary words. My sides have ached with laughter watching the kids’ school presentations —– poems set to music, a homemade video of the earth’s destruction by fire and ice and Sidney’s live performance of a rap with Dickinson’s “A Bird Came Down the Walk.” I have heard piano, cello and violin music in my home. So there have been great blessings mixed in too, but Lord, I am weary. In the midst of laughter, there are tears. In the midst of tears, there is laughter and I am weary. Then I came home from a shopping trip. I always come home from shopping ready to hide —- something about Wal-mart does not elicit that peaceful, easy feeling. Shocking, no? But then, I came home and I walked into the kitchen to this . . . . . . . . .
And I could not stop the smile. My eldest son’s math was overtaken by the birds. 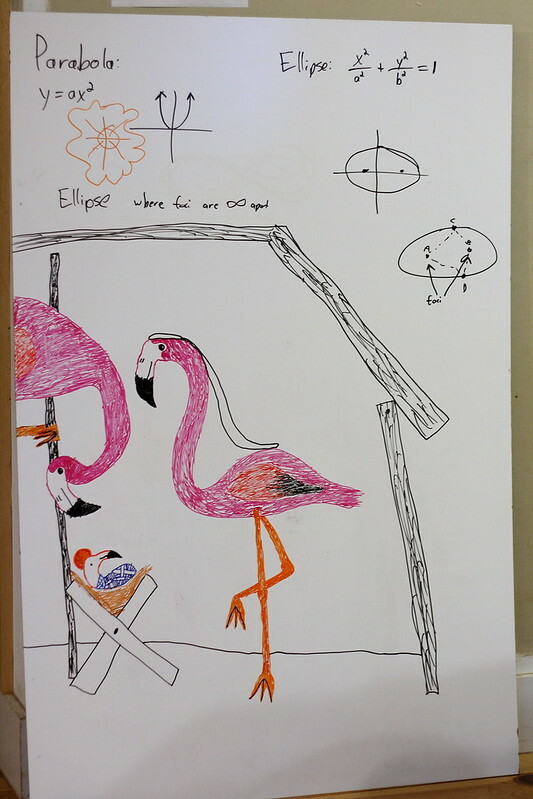 My 10 yo daughter has been infatuated with all things flamingo since she was very young. 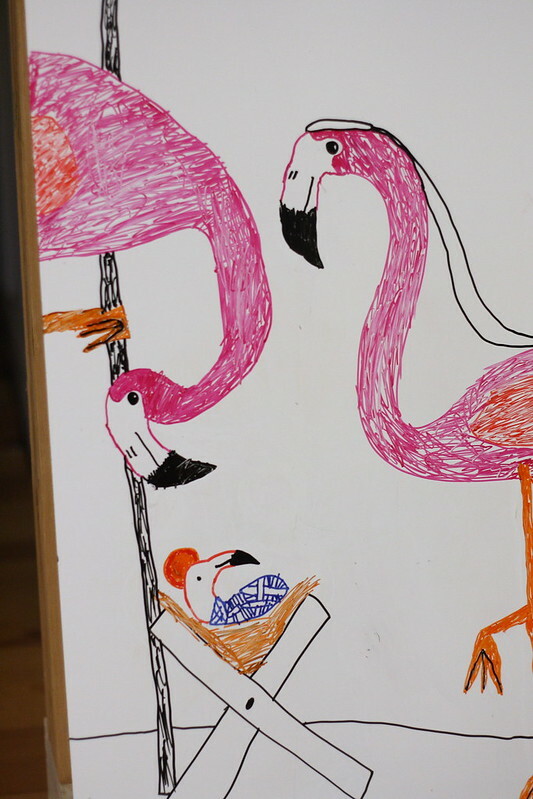 Originally, she drew stick flamingos on all her schoolwork, but she has progressed. A closer picture for detail . . . . I guess a flamingo nativity might be considered rather strange by some. I find it rather quirky and fun-loving, an imaginative creation of a tender, geniune heart. So . . . .after weighing the bad and the good . . . . .I think the good won out.